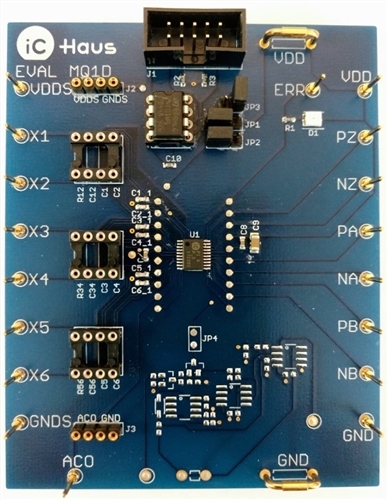 iC-PI is an interpolator with a non-linear A/D converter which digitizes sine/ cosine sensor signals using a count-safe vector tracking conversion with selectable resolution and hysteresis. The angle position is output incrementally by differential RS422 drivers as an encoder quadrature signal with a zero pulse. A pre-selectable minimum edge distance ensures glitch-free output signals and prevents counting errors which in turn boosts the noise immunity of the position encoder. The integrated signal conditioning unit allows signal amplitudes and offset voltages to be calibrated accurately and any phase error between the sine and cosine signals to be corrected. 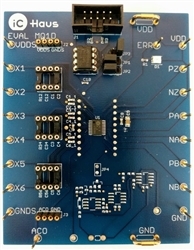 As angle data is offered to the I2C interface, signal adaption can be easily automated using an MCU.